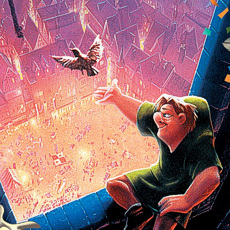 20 years ago, Disney released an animated adaptation of The Hunchback of Notre Dame. It was a bold choice by the House of Mouse given that the dark Victor Hugo classic was far from a family-friendly story. The film nevertheless managed to receive positive critical praise and was a decent box office hit. In 1999, Disney took another chance and adapted their version of the story into a stage musical in Germany. Being closer to the original source material in tone, it had a successful three-year run. In the years that followed, Alan Menken and Stephen Schwartz had been trying to bring the show to North America before running successful pre-Broadway tryouts in San Diego, California in the fall of 2014 and then in Millburn, New Jersey in the spring of 2015. Disney does not have plans to bring the show to Broadway at the time of this writing. 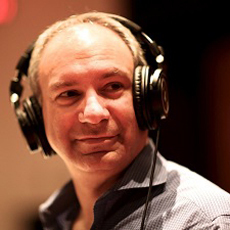 Nonetheless, they have allowed Menken and Schwartz to proceed with making a cast recording through Ghostlight Records. I was fortunate enough to have seen the show during the San Diego run. While it could have used some tweaks here and there, it was an absolutely fantastic production. Perhaps the best way for me to describe the show is that it utilized the animated feature as a template. The structure of the story was as it was presented in the film along with the songs and visual look. From there, Menken, Schwartz, and book writer Peter Parnell incorporated as much from the original novel when they could be used in their telling of the story, more so than the Germany production. Examples of this include Frollo being Archdeacon and having a carefree brother named Jehan, Quasimodo being deaf as a result of being the bell ringer, and restoring the somber ending. Furthermore, the comedic sidekick characters were eliminated, in their place being the Congregation, or rather the Ensemble, portraying omniscient narrators, minor characters, and the statues and gargoyles, who were more of Quasimodo’s hallucinations than living beings. Cast recordings are always interesting albums to listen to. Given that the most a disc can run is under 80 minutes, much of the play’s two and a half hours of storytelling is sacrificed in favor of getting in nearly all of the sections of each song onto the disc. 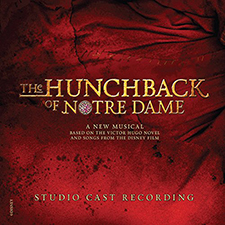 For a cast recording to have two discs, the production would usually need to have been a sung-through musical, or complete singing from start to finish, which The Hunchback of Notre Dame is not. The synopsis in the booklet has enough writing to cover the main story points, but, as is generally the case, it’s not quite the same as experiencing the story being acted out. Then again, we’re fortunate we’re getting a cast recording at all. And it succeeds in capturing the spectacle from the stage, creating a dramatic, yet pleasant listen. Menken’s music shines wonderfully here as it did in the film and Schwartz comes up with some fine new lyrics to be sung. It’s clear that they had great satisfaction in being able to finally go further creatively with the subject. 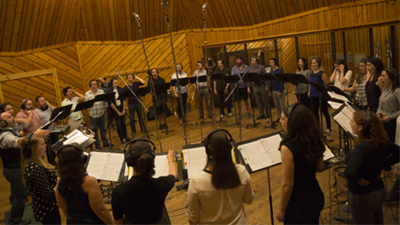 Recognizing the differences is key when comparing the cast recording to the film soundtrack. Virtually all of the songs from the film are carried over, but there are obvious changes to the lyrics. A good example is “Topsy Turvy,” which is expanded to include an introduction for Phoebus, along with songs written for the play, “Rest and Recreation” and “Rhythm of the Tambourine.” With the loss of the comedic gargoyles, “A Guy Like You” is replaced with “Flight Into Egypt,” where instead of Quasimodo being told that he can be loved despite his deformity, he is encouraged to believe he has the strength to protect Esmeralda by conveying the story of Saint Aphrodisius. The new songs, by in large, work with the original songs and the structure of the storytelling. 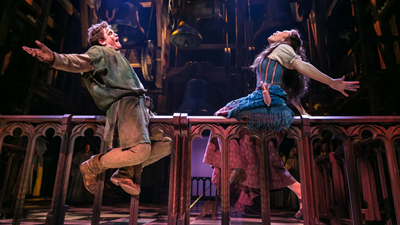 The stand-outs are “Top of the World,” where Esmeralda expresses her admiration of the view of the city from Notre Dame, and “Made of Stone,” where Quasimodo vents his frustrations over the pain and suffering he believes his actions cause. Some might not be sure about the rhythm of “Esmeralda,” which closes the first act, as it doesn’t match the Gothic tone of the other songs, but I think it’s fine. Part of the pleasure in listening to the music is hearing the great cast. Patrick Page excels as Frollo, just having the right tone that respects the late Tony Jay while developing his own voice. Ciara Renée is angelic as Esmeralda compared to the partially-raspy Heidi Mollenhauer (who was the singing voice of the character in the animated movie), and Erik Liberman exudes the same mischievous glee Paul Kandel had as Clopin. While Andrew Samonsky doesn’t have the same heroic tone Kevin Kline had as Phoebus, he has the right singing voice for how the character is written in the show. 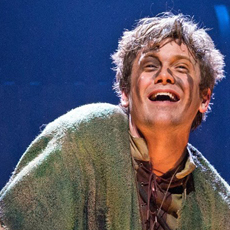 And then there’s Michael Arden, who shapes Quasimodo differently than Tom Hulce by playing with the character’s deafness. While not quite as noticeable in the cast recording as it is watching on stage, he develops a great voice where it is restrained when speaking to others, but soars when singing to himself. The Congregation do a fine job, though it is the choir that is worth hearing. Their “Entr’acte,” which opens the second act, is more than good enough to leave listeners in awe. The cast recording for The Hunchback of Notre Dame is not perfect, as is usually the case with such albums. It nonetheless captures the majestic music of the production that should be a pleasure to listen to for fans old and new. Alan Menken, Stephen Schwartz, and the cast have shaped their telling of the story musically that not only stands out positively compared with the animated feature, but against any other show. More importantly, it instills the hope that Disney will eventually bring the production to Broadway, where it belongs.